New York City is renowned for its wonderful entertainment venues and attractions. When in the Big Apple, you should visit these top 10 family friendly destinations. This area of the city provides the quintessential New York experience. Your family can tour the beautifully landscaped 843-acre green space aboard a horse-drawn carriage. Popular attractions include the zoo, the historic carousel, Belvedere’s Castle and the Discovery Center. Children can climb rock walls, ride paddleboats and picnic beside the lake. Kids will enjoy this museum that served as the backdrop for the popular movie “Night at the Museum.” Twenty-seven interconnected buildings display 45 permanent exhibits. The “Please Touch” signs invite visitors to explore the interactive displays. Highlights include massive dinosaur skeletons, planetarium star shows and rare mineral formations, such as sapphires, emeralds and meteorites. This attraction is one of the world’s premiere institutions. The aerial tram and shuttle make it easier to view exhibits at this 265-acre institution. More than 4,000 animals from 650 different species, including red pandas and snow leopards, live in the zoological park. Popular exhibits include the baboon reserve and the butterfly garden. No trip to New York City is complete with a visit to Times Square, one of the most visited places on earth. Families can enjoy a wide assortment of shops, restaurants and entertainment venues. Kid friendly attractions include M&M World, Ripley’s Believe It Or Not! and Toys ‘R’ Us. Broadway shows like The Lion King, Annie and Cinderella will please the entire family. This landmark has welcomed immigrants to the United States since 1886. Tour boats depart from Battery Park. Visit the pedestal and museum to experience the majestic setting and the story behind the monument. Your family will cherish the unforgettable view from Lady Liberty’s crown. 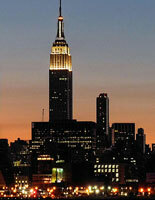 The entire family will enjoy this state-of-the-art observatory located atop the Rockefeller Center skyscraper. The specially designed glass elevators provide a multimedia light and sound show as you ride to the upper level. Your family will enjoy a breathtaking view of Manhattan’s attractions, including the Chrysler and Empire State Buildings. Looking for a fun way to sightsee? This bus tour is a great way to see famous New York City landmarks like the Apollo Theater, Chinatown, the Rockefeller Center and Times Square. The route includes Downtown, Uptown, the Bronx and Brooklyn. Passengers can visit the sites or remain on the bus throughout the tour. This landmark isn’t only a museum, it’s a piece of history. It was the first institution of its kind in the United States. Children can investigate a wide variety of object on display in the interactive exhibits, such as masks, dolls, fossils and everyday items. Children can create their own artwork and pretend to be explorers and boat captains. Located in Queens, this hands-on science and technology museum has more than 450 interactive exhibits designed to inspire children of all ages. Staff members perform live biology and chemistry demonstrations during interactive sessions. Children will learn about renewable energy, ecosystems and space travel. Experience New York from a unique perspective while aboard this water cruise. The two-hour tour allows families to see famous landmarks along the Hudson and East Rivers, including the South Street Seaport, Ellis Island and the USS Intrepid Pier. Your knowledgeable guide will share the untold stories of these world-famous attractions.